How to maintain your posture while riding a horse. Horses are used to being mounted from the left side. 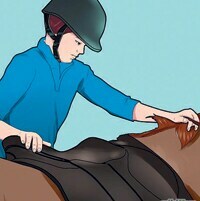 Face the saddle from port and shorten the inside rein, making sure you have a good grip on it all the while. Lift your foot into the stirrup and, keeping the weight on the ball of your feet, grab the front of the saddle. In case of an English saddle, grab the pommel. Put your weight on the stirrup and pull yourself up in the manner of climbing stairs. You could ask a friend to push down the other stirrup so the saddle stays steady. When your belly is level with the horse, swing the back leg over to the other side without bumping into the horse. Lower yourself gently into the seat and adjust it.